Penistaja Mesa is one of many badland regions in northwest New Mexico, all of which have similar, varied landscapes of strangely eroded rocks, undulating multicolored clayish mounds, and large fragments of petrified wood, but unlike the more well-known Bisti and De-Na-Zin, the surroundings here are quite overgrown, and the interesting sites are less numerous, more dispersed, and so take more effort to locate. 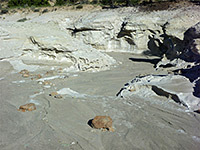 In this respect the mesa is similar to the Ojito Wilderness, 30 miles south near San Isidro. 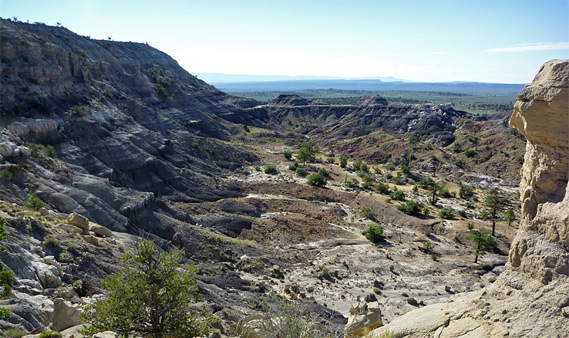 Like Ojito, Penistaja Mesa lies on the east side of the continental divide so is not part of the San Juan drainage system where most of the badlands are found, but the rocks are similar in appearance - from the Nacimento Formation, a mix of sandstone and shale from the Palaeocene epoch. The mesa is bordered by other, equally little-visited badlands to the east (Mesa de Cuba) and west (Ceja Pelon). 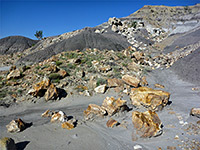 The top of Penistaja Mesa is flat, partly wooded and not so interesting; the rock formations are scattered along the southern edge, which is eroded into numerous twisting ravines and narrow promontories, sloping down to stark grey badlands, the best area being about 2 miles across, though the mesa continues some distance northeast but seems to be more overgrown, with fewer patches of exposed rocks. Hence about half a day is enough to explore the area. Penistaja Mesa and adjacent Ceja Pelon are reached from the east by driving 9 miles along Hwy 195 from Cuba and forking due west along a straight, unpaved track over hard-pressed earth (impassable if wet) that crosses partly agricultural land and eventually links with other routes across the Navajo reservation which provide alternative access to the mesa from the west - BIA 23 and BIA 9. After 7.5 miles along this road, a narrower, unsignposted though still generally good track forks due north, passing a spring and tank at the site of the old settlement of Penistaja, soon afterwards coming within sight of grey badlands to the east, then reaching a junction after 2.6 miles with another track to the west. The junction is a suitable parking place, as track has high verges elsewhere, with few places to stop. The main route continues northwards along the side of the mesa, past a ranch, though all the land to the south is publicly owned and so fine for primitive camping as well as hiking. The track seems very little used and the usual ranch access is probably from the north. The south edge of Penistaja Mesa is clearly visible from the road, to the east, and doesn't look too promising at first, with muted colors, no big hoodoos and partly covered by grass and bushes. 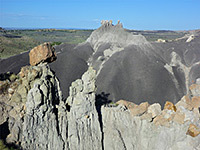 There is a group of black and grey badlands a little way south but they lack any major rock formations. 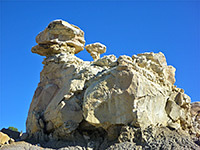 However, after a short walk across sagebrush flats towards the mesa, more interesting features do start to appear including tall shapely hoodoos and sizable blocks of reddish-yellow petrified wood. After an intermediate, southwards-pointing ridge, a larger area of badlands and ravines comes into view, curving southwards and ending at an isolated pinnacle. Careful explanation reveal such features as sinkholes, balanced rocks, rocky drainages, a big pile of pure white sandstone boulders, unvegetated mud hills and multicolored, layered rocks. The furthest ridge is about 1.5 miles from the road, beyond which the land falls away rather more, becoming flatter and grassy, though the low cliffs at the edge of the mesa continue northeast. 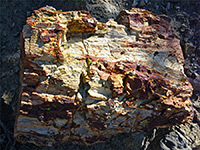 Petrified wood is scattered in various locations, seemingly not concentrated at one particular level. 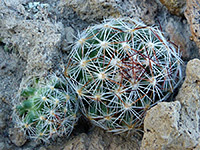 Vegetation in this region is typical of the high desert, with ancient, weather beaten juniper trees, a selection of cacti including the small coryphantha vivipara, and a scattering of delicate wildflowers such as ipomopsis longiflora, tradescantia occidentalis, mirabilis linearis and herrickia glauca. Also of note are three rock cairns, constructed right at the edge of the mesa rim, each around nine feet high and apparently relatively old. They are arranged in a line, each separated by about an eighth of a mile and are thought to be a relic of ancient Navajo civilisations in this region.